Most websites get the biggest slice of their traffic pie from Google; and Facebook is the most frequent #2. But the other social networks are starting to be significant to some sites. Now, let’s see how they stack up in terms of driving traffic. As part of the Media Industry Social Leaderboard, we’ve been keeping tabs. It’s worth keeping in mind that Facebook still massively outweighs its social brethren in total impact, making up 97% of social traffic to the top 50. But in today’s world of meteoric rises and rapid falls, one of the players lurking in the other 3% (Twitter, Pinterest or Google+) could turn out to be the behemoth of tomorrow. Twitter is definitively the #2 social referrer for publishers, but its share is declining – it grew by a lackluster 1% from February to May. Meanwhile, Pinterest is emerging as a formidable competitor: their last three months were just pinsane with 210% growth. If they continue on that trajectory, they’ll be bigger than Twitter as a traffic referrer by summer’s end. Will that happen? Is Pinterest already edging out Twitter as we speak? Stay tuned for next month’s Social Leaderboard results. 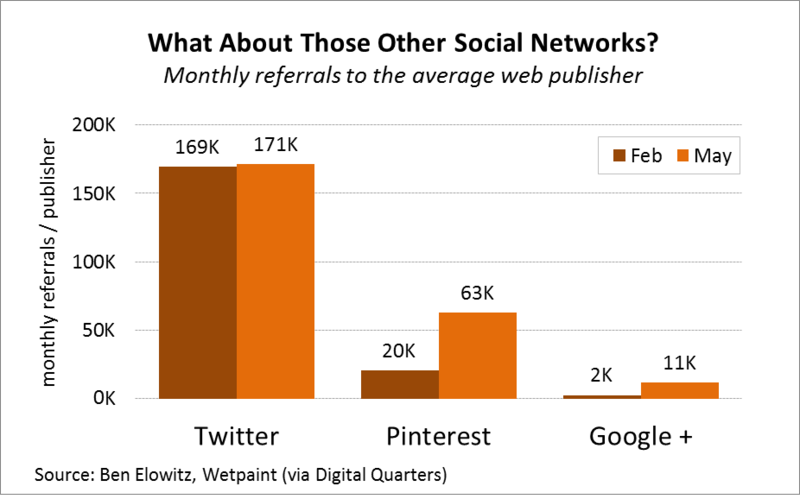 Pinterest passed Twitter as a source of referrals for wikiHow.com months ago. That said, wikiHow has never done great on Twitter.